I know that here in the UK we are known as a nation of tea drinkers but recent years have seen us embrace coffee as our go to morning jolt. We take it so seriously now that, here in London, we even have a week long coffee festival. Aficionados can follow the trail in search of their ultimate cup. The rise of the American chain coffee houses may have blazed the trail here in London but it's the Australian and New Zealand coffee houses that seem to scoop all the accolades. Of course coffee has been on these shores for many centuries now and has always been a drink for the fashionable youth and those who fancy their caffeine come from something other than tea. During the 17th and 18th centuries the coffeehouses of London are where people gathered to exchange news, thoughts and gossip. Due to the lack of alcohol sold in these establishments they were seen as a meeting place where serious ideas might be born. Such was their reputation of generating thoughtful conversations, they became known as penny universities, owing to the fact that the price of a cup of coffee was one penny. Things seem much the same when you enter a coffeehouse in 2016. Full of earnest hipsters whiling away the hours while on their devices with a table that might well be a mobile office. Still, I’m sure, a hub for creative ideas. I’m sure the coffee selection available today is much larger. Somewhere along the way someone saw that this was an opportunity to be seized, offer an exotic array of blends with a multitude of ways to serve it, and make your fortune in this deep dark elixir. Now that it is such a specialised beverage, people are beginning to take their coffee at home far more seriously as well. You can now have all the paraphernalia at home to grind, froth and percolate your perfect cup. But, even if you don’t opt for the full blown espresso machine at home, you can still up your coffee game by serving it in something special. The Georgians were the first to produce stylish wares to present your coffee at home. 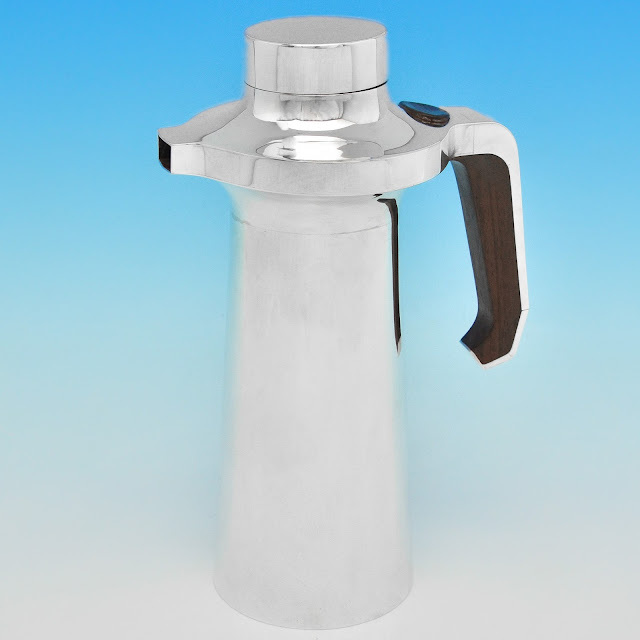 Made in sterling silver, the coffee pot was both practical and elegant. 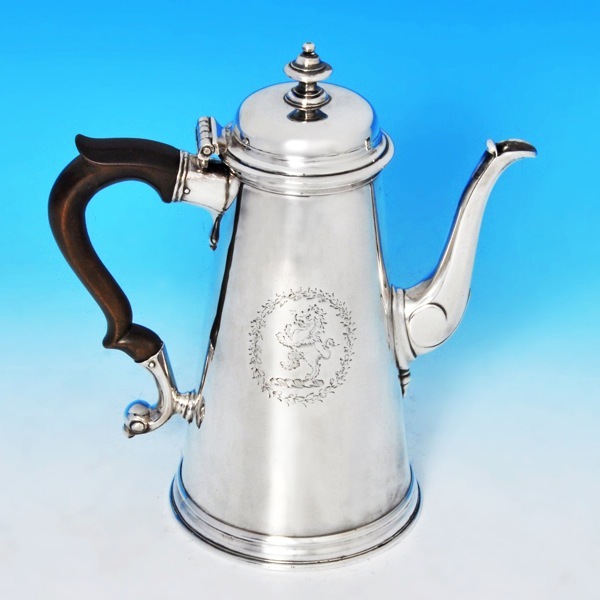 Here at I. Franks we have some stunning examples of Georgian coffee pots, bearing hallmarks from as early as 1728, heading right the way through the eras to an Elizabeth II hallmarked in 1976. Of course, if you are lucky enough to have an espresso machine at home you may not feel the need to possess a coffee pot but you can still add a touch of silver by simply using a lovely little silver coffee spoon. 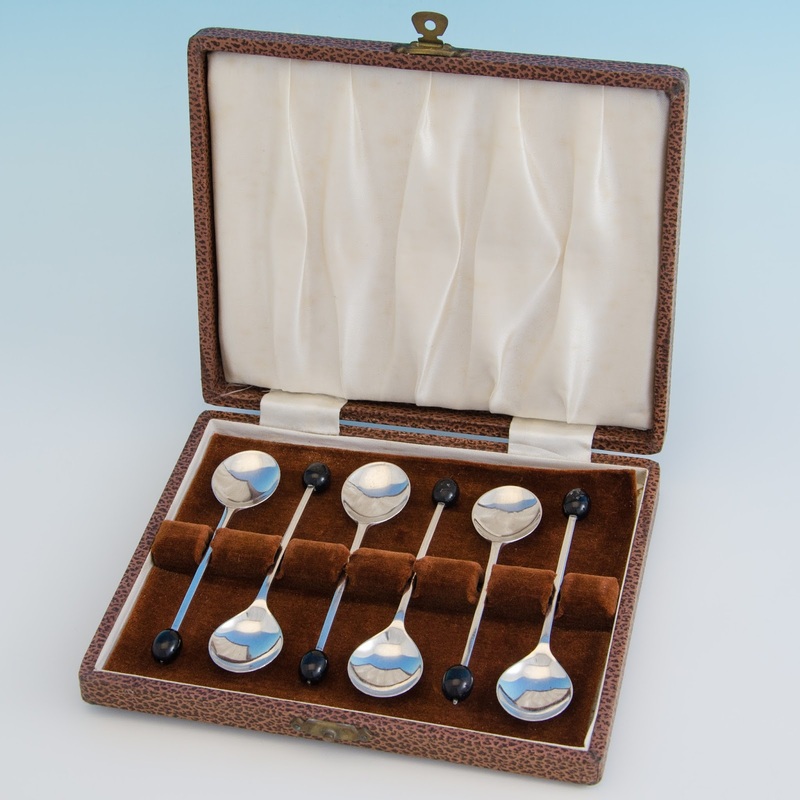 Most often sold in sets of six, they are a nice and affordable way to add a touch of elegance to your daily grind.